In His Majesty's Scholarly Service: O, February! I'm lying in my bed right now at the beginning of what promises to be my laziest weekend in a while. After two weeks of trips that began at the crack of dawn on the first day of the weekend, I'm perfectly content to spend the next two days a little closer to home. I'm also glad to have this time because there's so much to write about from the last week. Apologies for the delayed update; I was mired in grading during my usual blog-posting times, and I have enough adventures to share that I figured I'd wait until I had a serious Chunk Of Time in which to share them. I suppose I can divide this post into two sections: Jerusalem and Everything Else, including my birthday. Are you excited yet? Don't worry, there will be pictures. Last weekend, King's Academy graced its winter-weary faculty and students with a perfectly timed long weekend. After a typically long and busy Wednesday, we were suddenly faced with the prospect of three whole days of freedom; I'd say it was a novel concept, but in reality we haven't had back-to-back 5-day weeks since the beginning of 2014, so I should probably stop complaining. Anyway, Chase, Meg, Yasmine, and I had been charting our course for three days of adventure for a while, and early Thursday morning, the journey began. We were going to Jerusalem! I'm realizing how many pictures I want to put in here. Get ready for a long one. 9:35 make it through line; Israeli security/passport check #1. Wait for Yasmine to get double-checked by security. We had always expected that bringing an observant Muslim friend would delay the process a bit; no worries. 10:25 after another wait, make it through Israeli passport check #2. Now, the waiting game: Yasmine doesn't make it, and neither do the two teachers with Lebanese and Syrian passport stamps. 11:00 still waiting for the three to come through the checkpoint. Playing MASH and eating snacks. Taking bets on who'll make it through first. 11:25 everyone's through! Heather won the bet. Let's go to Jerusalem! After another bus ride, we arrived at our stop near Damascus Gate close to 1pm, for a total trip time of about six hours. This was no surprise or hassle to anyone; we all knew it'd be worth the trip anyway, and to be honest, we didn't know the half of it. This, if you can believe it, is the view from where we were staying. The Ecce Homo Convent is about a 3-minute walk from Damascus Gate, past a well-known and deservedly popular falafel restaurant (of which we availed ourselves). Once you climb to the third-floor balcony, this preposterously gorgeous sight awaits. Immediately we were convinced that Yasmine had made the right choice of lodging. Here's my "room" (that is, cubby w/curtain) in the convent, in case you were wondering. I didn't actually stay there Thursday night, but more on that later. And so began our adventure! 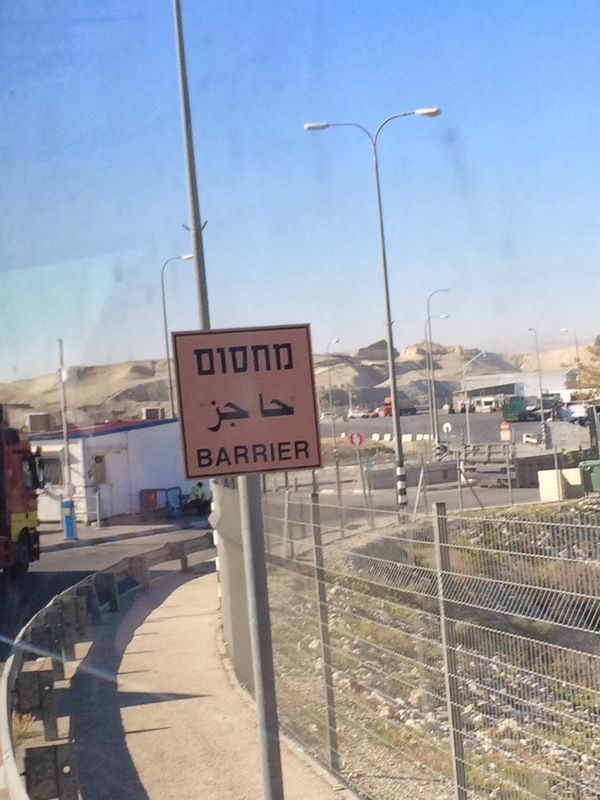 The first stop was the Wall, and I was grateful that the others gave me a chance to put on tefillin and offer up a few prayers. We wanted to go to the Dome of the Rock, but it was already closed to tourists when we showed up. Next time. Next, we wended our way to the Church of the Holy Sepulchre (no pictures because they're all kinda dark); a real Frankenstein of a building packed with tourists and monks and incense and insanely important religious artifacts. Hadn't been since my first trip in 1999, I think; it was cool to go back. It's doused liberally with simple syrup, and also usually covered with powdered sugar, but we didn't get any this time because he was already closed when we showed up. Somehow, though, we managed to convince him to make one more batch for us, and by the time we left, all four of his tables had filled back up. Understandably so, too: the stuff was delicious. (We went back on Friday). Never full enough, we met up with Chase's friend Jocelynn and brought her along to our next stop: West Jerusalem. The plan was to meet Micah Hendler (Whiff of 2011; currently directing a choir of Israeli and Palestinian teenagers) for dinner on Emek Refaim, and I trusted Google Maps to get us there on foot, which it did with no trouble at all. As if that weren't enough, the old train station has been repurposed to include shops, restaurants, and (in the center of the frame) a giant and fairly creepy wooden sculpture of a man extending his hand as if to move a checkers piece. It was here that we ran into the other King's teachers, completely by chance, and arranged to meet them for a tour under the Western Wall the following morning. 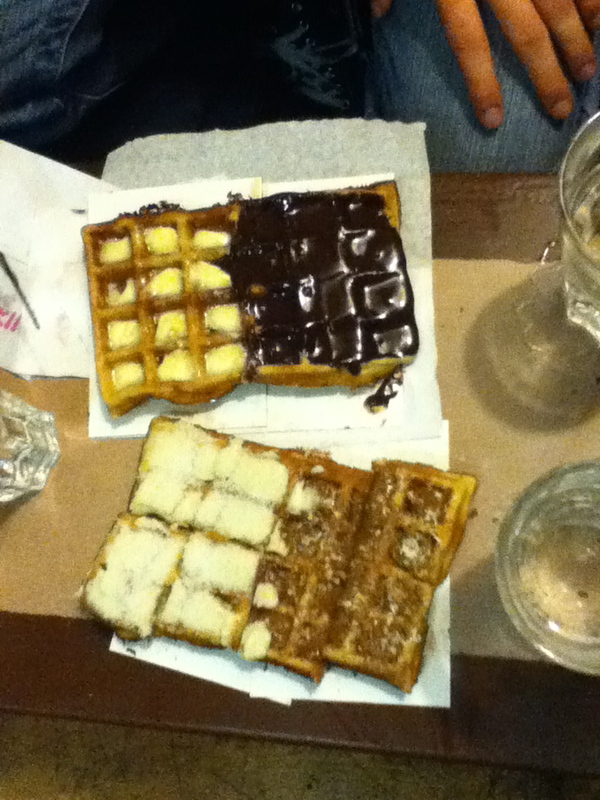 Then it was up to Zion Square for waffles at Babette (this isn't my picture, but it's very accurate). This place is well-known, and again for good reason: the waffles, and especially the toppings, were ridiculous. We went all-out with six different toppings to sample; if I had to pick a favorite, it'd be a tie between hot fudge, butterscotch, whipped cream with strawberries, sour cream and applesauce (! ), cinnamon cream cheese, and maple syrup. Yes, that's all six. They were all that good. So I bid farewell to the others, who wanted to make it back to the convent for the 11pm curfew, and met back up with Micah in Zion Square for a little night out. He took me to Mahane Yehuda, the outdoor shuk which at night becomes a seriously hip bar scene. 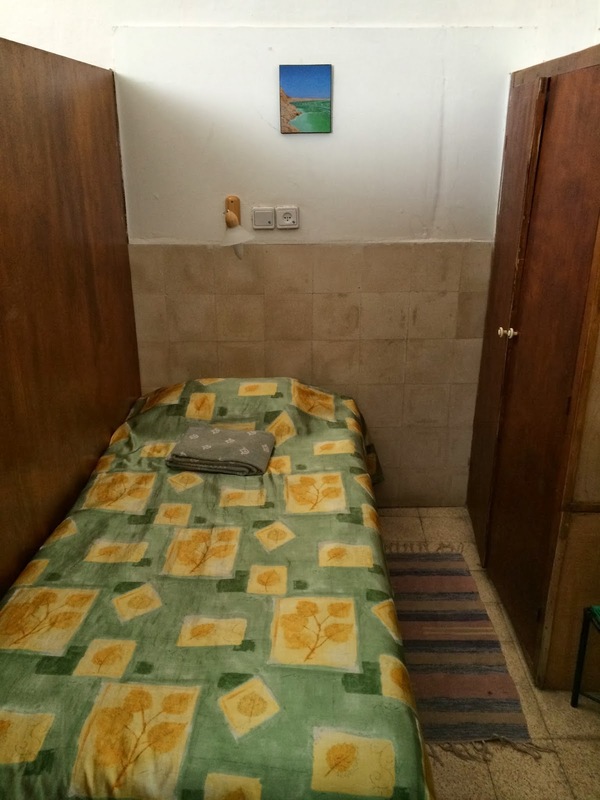 We grabbed Palestine's finest Taybeh beers at a place that was playing Arabic music, caught up about old times, and I crashed on the futon at his very well-located apartment. All told, a pretty fantastic first day, but there was plenty more to come. When I arrived at Ecce Homo, Chase had already been awake for hours due to incessant rooster crowing outside the window. I immediately had less regret for my own decision to get up early. And then we were off! First a quick stop at St. Anne's Church, highly regarded for its ludicrously beautiful acoustics. I would be lying if I said that Meg, Jocelynn, and I didn't throw down a little "Amazing Grace," and I would've been happy to keep singing except that some church group came in and wanted to experience the place for themselves. Which was fine, but I wish they'd had at least two-part harmony. Unison? Really? We met up successfully with the other teachers for the tour under the Wall, but were informed upon arrival that the next tour wouldn't start for another 75 minutes or so. 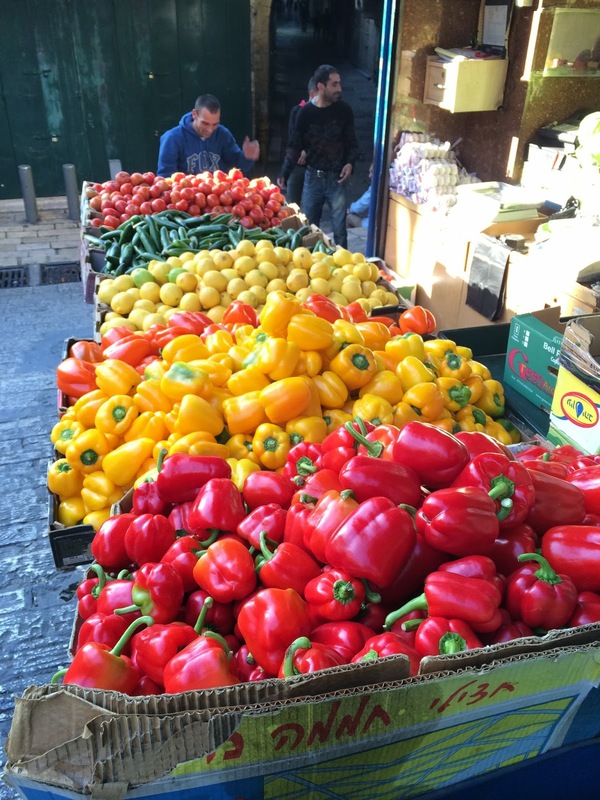 This prompted Matt and me to make a mad dash to get some shopping done Mahane Yehuda (basically retracing my steps from the morning, only further, and we took the beautifully clean and efficient light rail). I had no time for pictures, because we were literally ducking and weaving the whole way from the throngs of people entering the Old City for Muslim Friday prayers to the Friday morning market shoppers preparing for their Shabbat meals, but we got everything we went for: halvah for Matt, and some supplies for my own Shabbat meal (plus a yarmulke and an insanely delicious chocolate rugelach, because I could pay for them with change). And we made it back to the Wall in time! Here is a picture of what I believe to be Warren's Gate, the closest place you can get to the presumed site of the Holy of Holies. This is where I will briefly pause to reflect on the fact that this was in some ways not just a trip to an amazing city, but a trip to the amazing city. 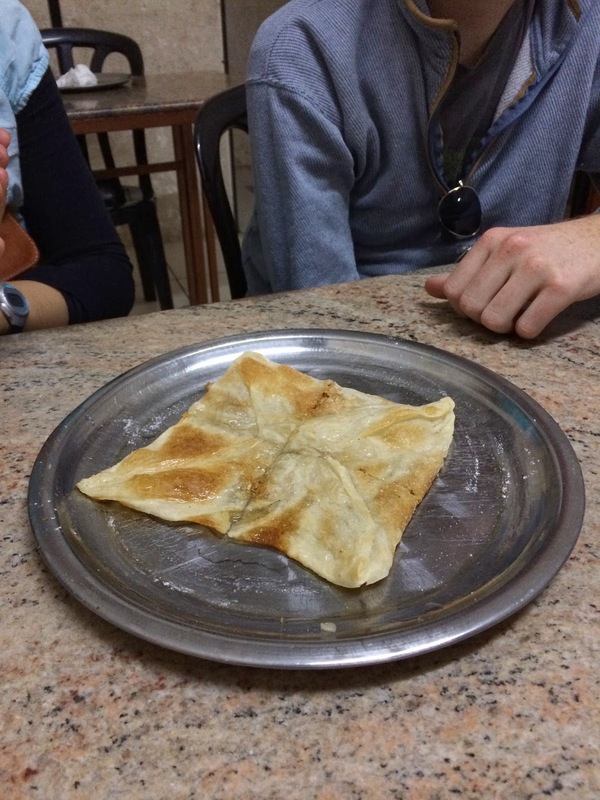 To travel with two Christians and a Muslim was a powerful and enlightening experience, and the feelings of wonder, connection, pride, and intense conflict that came over me throughout the weekend deserve more than a few blog sentences to do them justice. Jerusalem is an amazing place on the surface too, but it is inseparable from religious and historical dimensions both ancient and painfully modern, and it was a real privilege to be there and begin to feel viscerally and personally a place that most people aren't lucky enough to visit, and some people aren't allowed to visit at all. I'm always happy to elaborate one-on-one if you want to learn more. 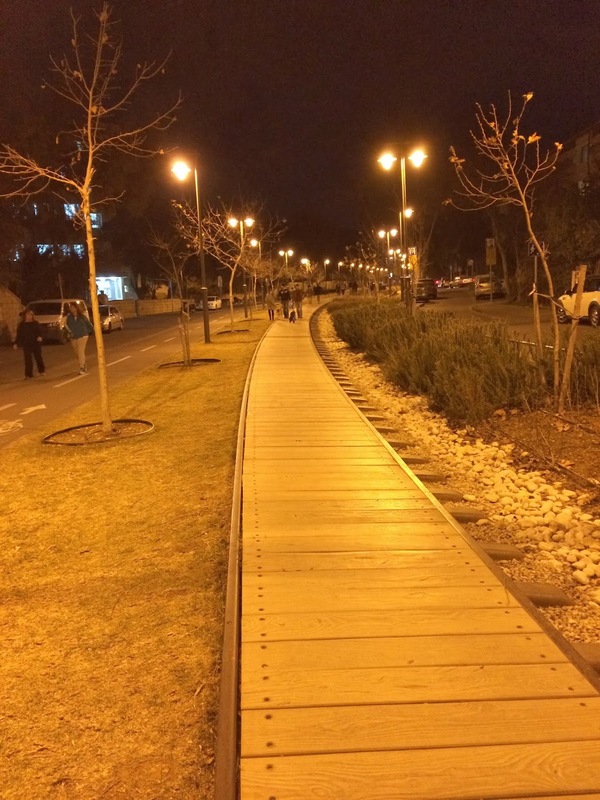 - walk back down the beautiful bike path to a synagogue at the bottom of Emek Refaim, where Micah had invited us to Nava Tehila's once-a-month musical Kabbalat Shabbat. 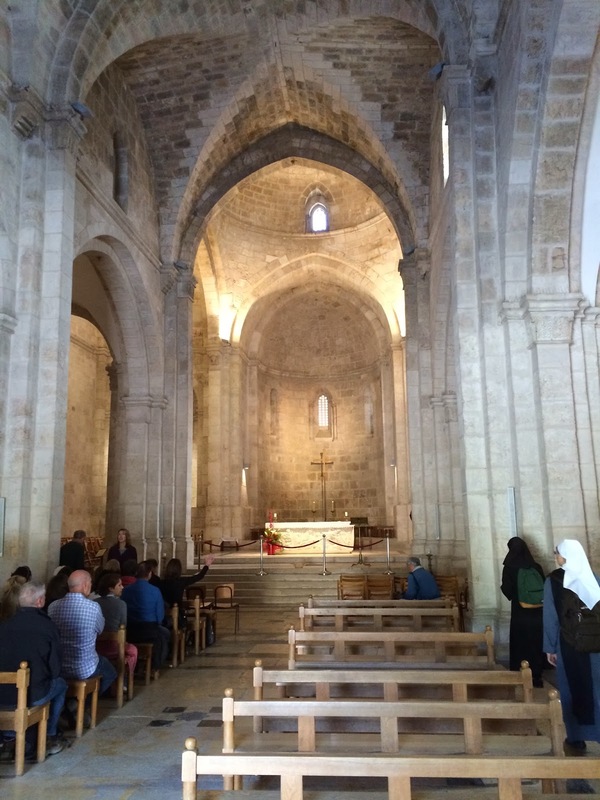 This was a highlight of the trip for all four of us, even the non-Jews: a 90-minute service led by a circle of singers, guitarists, percussionists, and one girl who played the cello. The rabbi, who was also one of the singers, spoke for a total of about 5 minutes scattered throughout the service; most of the time, we (seated in concentric circles around the musicians) listened, and sang, and felt the music. No tunes were familiar, but they were so easy to learn that the whole congregation would join in quickly enough. From sublimely soft, meditative pieces to reggae-inspired nigunim that had people up on their feet, the Nava musicians guided us through a powerful and deeply spiritual service whose meaning was not lost in translation on any one of us, or on the adorable French nuns who apparently come every month. I sincerely hope I get the chance to go back. - after the service, I again said goodbye to the other three, and Micah and I went to a potluck Shabbat dinner hosted by some American and British students at the Pardes Institute. It was a slightly more observant Shabbos than my typical ones, which I generally prefer if I'm going out somewhere, and the guests were an amazing mix of students and young professionals with thoughtful and varied perspectives on Judaism. Deep conversation and excellent food carried us into the night; my contributions, an eggplant dish and two boxes of chocolate rugelach from Marzipan bakery in Mahane Yehuda, went over very well. And then it was back to the convent, and to bed. On Saturday I began to understand what Chase had meant about the roosters, but eventually I and my feathered foes agreed that it was time to get up, and after breakfast at the convent and a brief shopping trip, it was back to the bus and back to the border. The trip home took about four hours, and I have to confess that I felt a twinge of what might have been homesickness as we pulled away from the Old City. For all the difficult and challenging feelings that Jerusalem, and Israel, can invoke, I still find myself drawn to it, and I have every intention of going back for our April long weekend (which happens to be during Pesach). I suppose this is a very rambly post already about a trip that happened a week ago, but there's a lot to do in that place, and a lot to say about it. I'll be back to our neighbor in the West before long, so keep your eyes peeled. Um...can I say anything about the last week that will be nearly as interesting as last weekend? Not really, no. It was a fine week of class and I'm a little baffled that February is one week from ending and Spring Break is two weeks from starting. Baffled, and also excited. I'm going to be in Istanbul in two weeks! Made from scratch, and they gave it to us on the house! Now that's class. 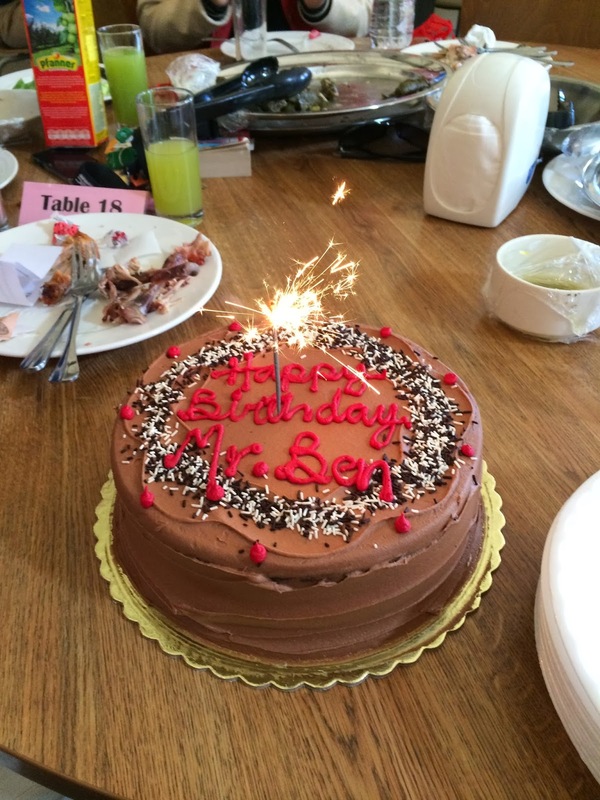 I don't think I ever expected a cake that referred to me as "Mr. Ben," and I must say that it was an excellent decision by the advisees. So now I'm 24, and King's did a great job ushering in the day, and having a free afternoon to Skype with the family really brought the whole thing home. I will spend the entirety of my 25th year of life in the employ of King's Academy, and although 23 might have had some splashy moments (college graduation; moving halfway around the world), I expect this year to bring no shortage of adventure, and more likely than not you'll all get to read about it. Well. It's been more than an hour since I started writing this post, and I feel like I need a break from "responsibility." Today, the birthday celebrations continue with a party for me and another teacher whose birthday was the 19th, preceded by a chili cook-off on-campus at which I'm apparently helping. A Friday of lounging around, party shopping, cooking and eating chili, and then enjoying the company of friends and food and drinks? I'll take it. February wanes; 24-dom waxes; bring on the next step.